Kellyanne Conway believes that the only way to fight the opioid crisis in the United States is to construct a border wall between the US and Mexico. Not only does she not understand where opioids come from, but her dangerous lack of knowledge on this issue is contributing to the opioid death toll that is rising by the day. Ring of Fire’s Farron Cousins explains why Kellyanne needs to be kicked off this commission immediately. According to a recent report in Politico, Kellyanne Conway who is a Counselor to Donald Trump, and also the appointed head of his opioid commission, for some reason, has been using her position as head of that opioid commission to not only ignore the opioid problem, but to use that power to push for Donald Trump’s border wall. The Politico report says that Kellyanne Conway is completely ignoring the experts on this issue, and she is not allowing experts in drug abuse to attend the commission’s meetings and give their take on the problem and the solutions that are necessary. And instead, is focusing on using this position to again push for Donald Trump’s border wall, as if that is somehow going to stop opioids from coming into the United States. 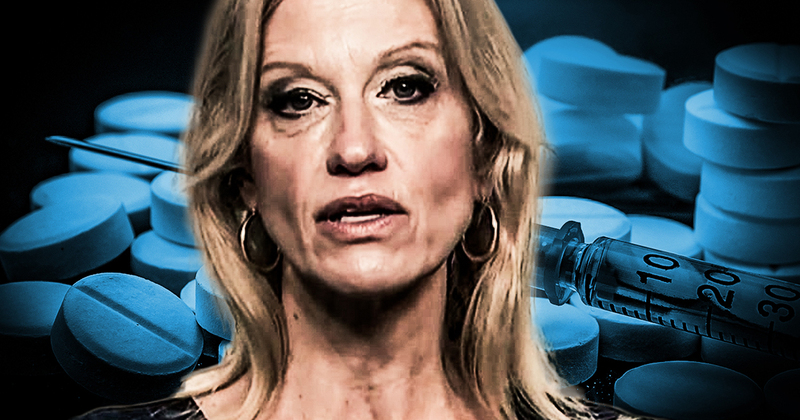 Kellyanne Conway, when she was appointed to this position, everyone who understands who this woman is, realized at that moment that Donald Trump doesn’t give a damn about the opioid crisis here in the United States. Politico points out that the death rate from it is 175 people every single day, other reports have that number down to about 115, but at least we know more than 100 people are dying in this country every single day from opioid overdoses. And apparently, Kellyanne Conway thinks that the best thing we can do is to build a border wall? That’s not where opioids are coming from! Opioids are coming from drug manufacturers. They’re coming from guys in suits. They’re coming from shareholders and board members. These aren’t drug dealers, they’re not drug hustlers standing on the corner in big trench coats with pockets of drugs in them. These are guys shipping them out in clearly marked trucks, handing them over to pharmacies in towns that have population of a few thousand, where they’re getting more than 2 million pills delivered. That is something that has happened as part of this epidemic. But Kellyanne Conway thinks if we build that border wall, there goes the opioids, and the best way, according to Kellyanne, to not get addicted to opioids is to just never start. Well therein lies another problem Kellyanne, and if you’d listened to your experts, you’d know this. This isn’t just about “Just say no,” it’s the fact that people are given prescriptions by a doctor, somebody that they trust, somebody who knows a hell of a lot more about medicine than they do. So they’re not going to second-guess that doctor’s prescription. So they go to a pharmacy, the pharmacy says, “Yep, here you go. Here’s all your pills.” And nobody along the way told this person that they will get addicted to these painkillers. Nobody. That’s the problem. This isn’t an illegal drug problem. This isn’t a border problem. This is a real public health crisis that has its roots at major pharmaceutical companies who are making billions of dollars every year pushing opioids on the American public while trying to hide the fact that these things are addictive. That is what the company’s own internal documents show. Those documents are readily available for anybody that wants to go online and get them. The companies knew these pills were addictive. They knew that they were sending millions of pills to towns with populations of a few thousand, and they knew those people were addicted, and they did it anyway. That’s what the problem is. This has nothing to do with the border. This has nothing to do with a border wall. This has nothing to do with immigration. This is good old-fashioned, American capitalism that’s killing more than 100 people every single day.